Millions of people fall sick even because of water-borne diseases. This may happen in spite of the use of water purifier. Now question could come to your mind - Are the water purifiers not effective? Don't they protect you from all the harmful bacteria and waterborne diseases? Well, this is because your old water purifier has a lot of toxins in it. Over time what happens is, the filters and cartridges get clogged. Due to this blockage, the impurities get transferred to the water you drink. Therefore, you may believe that you are drinking pure water from your water purifier but that's not always true. In the course of time, the quality of parts or filters deteriorates. So, It becomes very essential to replace your old water purifier with a new one or get timely service done. 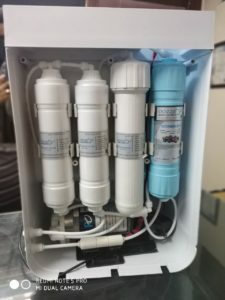 Oozze Water Purifiers are designed with advanced technologies without losing the essential minerals from water for the protection of your health. 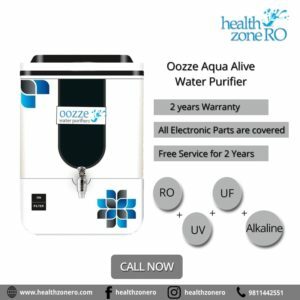 Moreover, We offer a unique 2-year warranty that comes with the New Oozze Aqua Aline RO+ Alklaine Water Purifier. Adding on, You also do not have to worry about the installation process. Everything is hassle-free here. And the best part is, even if your purifier is non- functional you can still get it exchanged and take your home a new and advanced water purifier. Showcase your family the care they deserve by ensuring their health and vitality. Call us now and Exchange your old Water Purifier with Brand New Oozze Alkaline Water Purifier.